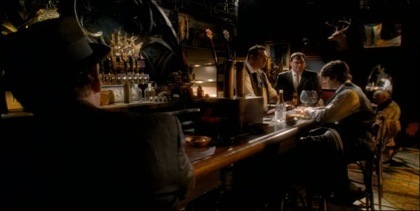 Scott Teller (Brandon Routh) recounts his story to a captive audience at the local bar. The slightly “glowy” look was accomplished with Black Promist filters in front of the lens, in combination with over-exposed backlights and “hotspots” on the bar. A romantic rooftop dinner... what could go wrong?? This scene was supposed to be set against a brilliant sunset (which would have been perfectly “in frame”, to the left of the buildings)... but the weather had other plans. Irving tried to lend the occasion a more romantic “sunset” feel with a graduated orange filter across the top of the frame. Same rooftop... different look. 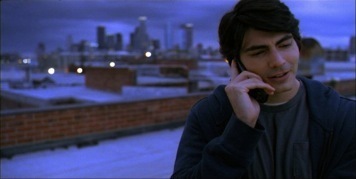 Dodging the rain, the TABLE FOR THREE crew moved rapidly from one rooftop scene to the next. 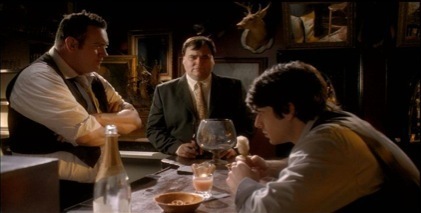 For this sequence, director Samonek wanted a “cooler” early-evening look (as the lights of the city come on in the background). Irving accomplished this “in camera” by shooting tungsten-balanced film without correcting for the bluer daylight color temperature. 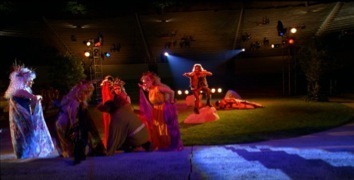 It can be difficult on a tight budget (and tight schedule) to devote the time and resources needed to pull off a large set-piece like this one: an outdoor performance of MIDSUMMER’S NIGHT DREAM. Irving and director Samonek knew that it would be worth it, however, to “open up” the movie and lend a particularly magical quality to Scott’s big date with Leslie (Jennifer Morrison, below). The producers were behind the idea 100%, and allocated the manpower and extra lighting needed to bring the gigantic space to life. Scott’s whole life changes (for the better?) when he chooses to room with the perfect couple: Mary (Sophia Bush) and Ryan (Jesse Bradford).